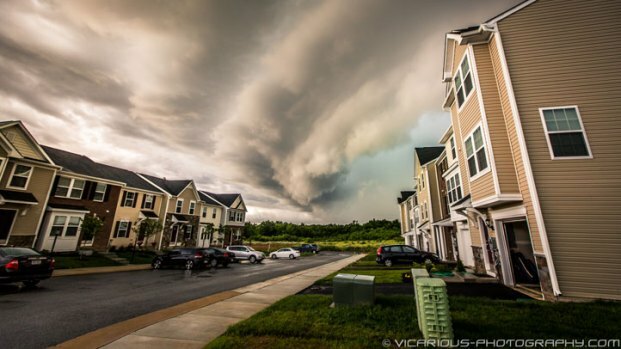 Living in Woodbine, Md., Dennis Davison never thought he'd look outside his door to see what looked like a tornado. But that's exactly what happened Monday evening. "We ran to the front door and there was -- what I deem was a funnel cloud..." he said. "And we saw the debris about a hundred feet in the air, just twirling around and around. And I thought, well, maybe it was just shingles, but then as soon as the storm left, which was like 30 seconds, I opened the big garage door on the house, and noticed that my garage is no longer here." 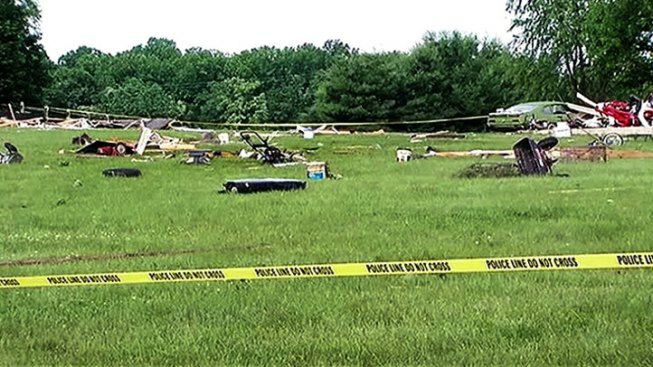 The National Weather Service said it will wait until Wednesday to make a determination whether a tornado did touch down in the Howard County community. 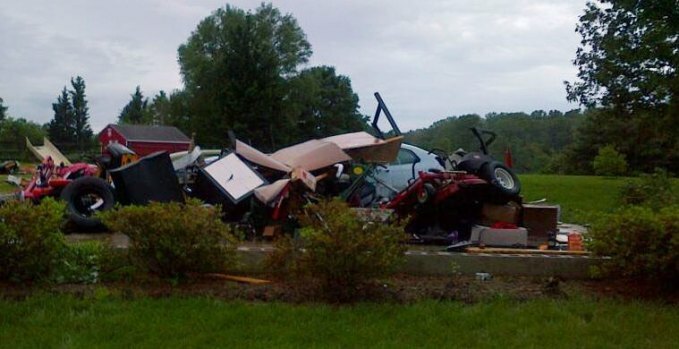 News4's Jackie Bensen reports on a possible tornado touchdown in Maryland, where one man's two-car garage and shed was completely flattened. In the meantime, residents are still assessing the damage done by Monday's powerful storms. Davison isn't the only one to say he saw a funnel cloud. "I get to the bottom of the stairs, I look at out of my porch, and we just see the funnel, and it's moving," said Woodbine resident Maria Martin. Davison's two-car garage and large work shed in Woodbine, Md., were flattened during the storm, which hit the area around 7 p.m. Debris -- including a crank shaft that weights 40 to 45 pounds -- now litters his property. "There's stuff embedded in the ground; there's huge holes in the ground that we don't know what hit it or where it went," he said. "I guess it's down the road somewhere." A man who lives a half-mile away said he thinks a door from Davison's shed is in his yard. The same storm wiped away a 200-year-old oak tree in Woodbine on what's known as the Martin farm. 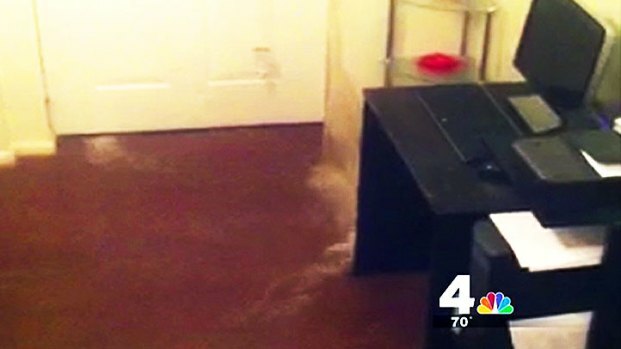 Storms Cause Flooding in Southeast D.C.
News4 reporter Shomari Stone spoke with a woman whose basement floor was ruined when water started pouring into her home Monday night as strong storms passed through the area. 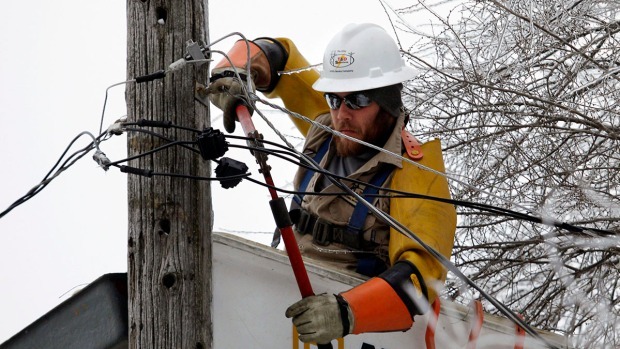 Down the street, crews were stringing line and replacing power poles Tuesday morning. The line of the damage was clearly visible. A tornado warning for much of the region expired 10 p.m. Monday. A warning means a tornado was indicated by radar or sighted by storm spotters. Flooding continues to be a concern Tuesday. Torrential rains turned creeks into rushing rivers in Howard County, and after the rain, the waters continued rising over the banks of the Western Branch Creek in Upper Marlboro. Downed wires closed Route 1 southbound at Holly Hill Road in Alexandria Tuesday morning. Berryville Road at the creek. Hispley Mill Road between the 24100 to the 24898 block. Izaak Walton Way between the 20500 block and 20574 block. Kingstead Road, at the creek. Loghouse Road between Newbury Road and Founders Road. West Old Baltimore Road at the creek. Fairfax County fire crews were on the scene of street flooding in the Huntington area of Alexandria Monday night, where drivers moved their cars to higher ground. The water receded around 10 p.m. Monday. The neighborhood is prone to flooding. In November, Fairfax County voters approved a stormwater bond referendum to grant $30 million to build a levy and pumping station. Residents say they need it build as soon as possible. And in the district, Southeast D.C. resident LaJuan Sligh sent in cellphone video of water rushing into the basement of her home on Frederick Douglass Court, destroying her wood floors and her son's downstairs bedroom. "I mean, I'm very disappointed... because I feel management should have notified me before this happened," Sligh said. Stay with News4 and NBCWashington.com for storm coverage.